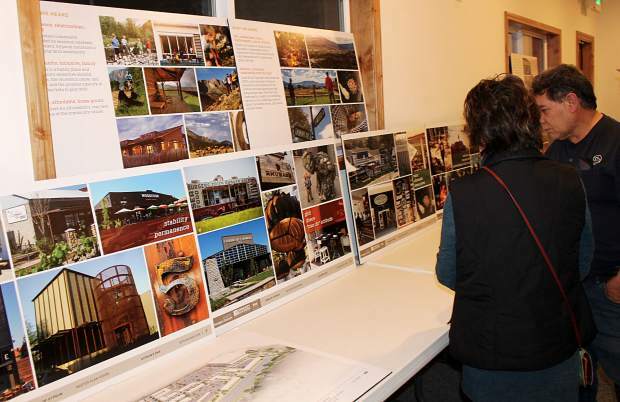 Gypsum Chamber members peruse the artist renderings competed as part of the town's master plan process. GYPSUM — Looking toward 2017, citizen engagement is a big theme for the town of Gypsum. During a State of the Town presentation at the Gypsum Chamber meeting Wednesday night, Gypsum Town Manager Jeff Shroll said the community hopes to complete an ambitious master planning effort this year. But before it writes the plan, the town needs to know what people think. “It is still a work in progress. It is your master plan,” said Shroll. Citizens who step up to comment now have something to comment about. The town has completed a set of artist renderings showing what neighborhoods in Gypsum can look like if the plan’s principles are realized. The drawings show a revamped commercial/residential neighborhood along Railroad Avenue — the town’s old downtown — a revitalized Interstate 70 entrance to town and more. Shroll noted that the U.S. Highway 6 devolution project is an important part of the community’s master plan effort. That project will remove the highway between and through Eagle and Gypsum from Colorado Department of Transportation control and turn it over to the towns. The communities and the state have been working out the details of the plan for a number of months. “We believe this (master plan) can come to life with a little less regulation,” said Shroll. The next public input session for the plan is Monday, March 13 and Shroll urged chamber members to attend. Shroll also told chamber members the town has projected $5 million in sales tax collections in 2017 — the highest ever for the community. “For municipalities in Colorado, our lifeline is sales tax,” said Shroll. A $30 million improvement project planned at the Eagle County Regional Airport terminal building is vital to Gypsum, Shroll said. He noted the airport, and the visitors it brings to Eagle County, is a major economic engine for the town. “That $5 million in revenues we project, a lot of it comes from visitors,” he said. Additionally, the town is predicting an uptick in building activity. “Most of that is from developments that were approved years ago and have been sitting in limbo land,” said Shroll. The year ahead includes an ambitious slate of special events in Gypsum beginning with the town’s Easter Eggstravaganza April 15. The town will revamp its Friday night film series this summer, featuring one event per month in June, July, August and September rather than the previous every Friday in June schedule. A diversity celebration is planned in early June and in September the Vail Valley Foundation’s Valley Tastings event will be staged at the Lundgren Theater Park. The town’s signature celebration — Gypsum Daze — is set for July 12-15. Gypsum Special Events Coordinator Krista DeHerrera said for the first time the Bravo! concert on Wednesday night will feature a 62-piece orchestra performing a program called “Gershwin Magic.” A pickleball tournament will debut during this year’s Gypsum Daze celebration, she said. The official announcement of the Gypsum Daze headliner will come April 1, DeHererra said.